I got married last week. Hence my absence from this space for the first time in seven years. It was a beautiful wedding in Acre, Israel, overlooking the ocean at sunset. My father wrote the music for the processional, which brought everyone to tears. My bride looked stunning, of course. We broke the glass, we danced, we ate and we celebrated until deep into the night. Outside the wedding hall stood a guard. Every wedding in Israel requires an armed guard to prevent terrorist attacks. Only the armed guards prevent the infliction of mass casualties at joyous events; only the armed guards protect the ceremonies that act as the foundation stones to civilization. In the general war against Islamofascism, civilization requires three elements. First, civilization requires building blocks — families dedicated to teaching traditional values, freedom and liberty to future generations. Second, civilization requires the armed guard — the men and women willing to put themselves on the line to protect those building blocks. Third, civilization requires leaders. Those leaders must recognize the value of the foundational blocks — they must understand the value of family. They must see that families represent a bulwark of independence against the overbearing state, and are small spheres of private initiative and activity. Just as importantly, those leaders must recognize the value of the armed guard. The leaders must understand that there are those who seek to destroy the freedom-loving family in favor of Islamic tyranny. Our leaders must see that our enemies are those who seek to create a world where fear of the theistic state trumps love of family. And most of all, our leaders must appreciate that the armed guard must fight the enemy with every weapon in civilization's arsenal. Any aspiring leader who shirks from nurturing, cherishing and, when necessary, deploying the armed guard in defense of freedom is unqualified to lead. Such leaders are pretenders. They may speak prettily and murmur soothing noises, but when the time comes to place the armed guard at the door, they balk. "Is the armed guard necessary?" they protest. "After all, he may provoke our enemy rather than defeating him. Would it not be better to leave the wedding unprotected and rely on the mercy of our nemeses?" The do-nothing leaders — men like Jimmy Carter and Barack Obama — destroy families. They leave families open to attack by trusting the untrustworthy. They watch idly while families are torn asunder, then disarm the armed guard in the fleeting hope that further appeasement will do the trick. This is worse than foolishness — it is unmitigated surrender. No country needs a leader who enters office waving a white flag. I am 24 years old. My wife is 20. Together we plan, with the help of God, on having healthy, happy, freedom-loving children who will grow up with the security provided by the armed guard. The question of who will lead America is no longer a political question to me — it is a personal question. Who will protect my family? Who will protect the future of my children? As the waves beat on the shore in Acre, the rabbi intoned the words of the sheva berachot — the blessings recited at the Jewish wedding ceremony. "Blessed are You, God, King of the Universe," sang the rabbi, "Who created joy and gladness, groom and bride, mirth, glad song, pleasure, delight, love, brotherhood, peace and companionship." Without the armed guard — and the leader who empowers the armed guard — the joy of liberty, the power of love, and the future of our children are murdered before they begin. 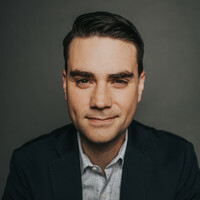 Ben Shapiro, 24, is a graduate of UCLA and Harvard Law School. He is the author of the new book "Project President: Bad Hair and Botox on the Road to the White House," as well as the national bestseller "Brainwashed: How Universities Indoctrinate America's Youth." To find out more about Ben Shapiro and read features by other Creators Syndicate writers and cartoonists, visit the Creators Syndicate website at www.creators.com.